Our security services ensure your residential or commercial property is secure with the latest smart technology. Security services can be customized to suit your individual security needs for the ultimate protection. Protect your home and family with 24/7 monitoring residential security services. Services include flood and fire monitoring, custom designed systems, and smart home solutions. Protect your home from disaster with alarm systems that alert you and the authorities when smoke or excess water is present. Customize your individual residential security needs and automate your home security at a glance. Our residential security products utilize the latest technology, ensuring your home is always protected. The security system can detect if your house is armed or not, knows who has opened your smart lock and will alert you appropriately. 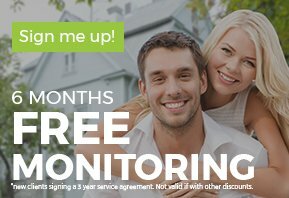 Protect your business day and night with our full service commercial monitoring system. Services include intrusion alarms, custom designed systems and card access. Our sensitive and responsive intrusion alarms, custom designed security systems and sophisticated card access that controls who gets in and out of yourbuilding, and monitors all access points ensure your commercial building is securely protected. The home automation ensures your home is always secure and protected. Automate your home security at a glance with integrated door locks, garage door control and energy management all accessible from your phone. Home automation ensures easy and manageable home protection. View your security cameras from your smartphone effortlessly and conveniently regardless of where you are. We offer a selection of security cameras with a variety of security features. With your free security evaluation we can recommend the right set for your situation. Install the doorbell security camera to quickly and easily see who is at your door and utilize the two-way voice communication system to communicate with your visitor from anywhere in the world. Outdoor cameras allow for reliable, full-coverage monitoring of your commercial or residential building. Building a new home or commercial property? Don’t overlook the security prewire. Our technicians will pre-wire alarms and CCTV systems while your home is being built. Electrical wiring is much easier during the framing process. We work with you and your builder to choose an alarm system to fit your budget. Contact us today for a professional installation and peace of mind. Our experienced residential and commercial security team is dedicated to professionally installing your security system so you can easily monitor your building anywhere. Your best choice for alarm systems and home automation in Kelowna!